COLUMBIA, Mo. – Officials at the University of Missouri have announced the official kickoff of MU’s new comprehensive funding campaign, Mizzou: Our Time to Lead. The new comprehensive campaign will seek to raise $1.3 billion to support and advance the educational and research goals of Missouri’s flagship university. Mizzou: Our Time to Lead will help to elevate MU’s status in the Association of American Universities (AAU) as well as significantly increase the University’s capacity for education, research, and student and faculty recruitment. An endowment is the conscious and deliberate decision by a donor to help build a reserve that creates the financial bedrock for the University. After a donor makes an endowed gift, the principal is deposited in an investment account and the annual income generated from that account is used for the donor’s intended purpose. This plan allows the donor’s initial gift to support the University in perpetuity, lasting long after the donation would have otherwise been exhausted. MU’s current endowment is $820 million and creates nearly $37 million per year used to support MU programs, scholarships and research. Campaign leaders hope to increase the endowment to well beyond $1 billion to allow MU to remain competitive with its peers in all areas regardless of the economy’s fluctuations. MU currently houses several signature centers and institutes, which are the engines of research and service growth that enhance the lives of citizens of our state, nation and around the world. Examples of these centers and institutes include the newly announced $25 million Kinder Institute for Constitutional Democracy, the Thompson Center for Autism & Neurodevelopmental Disorders, the Reynolds Journalism Institute and the Christopher S. Bond Life Sciences Center. Campaign leaders envision five to 10 new centers or institutes with endowments of $10 million or more. State funding has not supported a new academic building on the MU campus in 12 years. 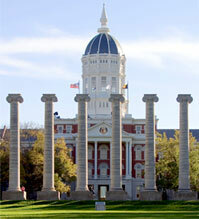 MU cannot achieve global leadership in research, teaching and education without a campus renaissance. Campaign leaders will seek public and private partnerships to fund new academic buildings including a new School of Music building, a new Fine Arts building, a teaching winery, and renovations to Lafferre Hall, which began this summer and were made possible in part by matching funds from the state. Many other new facilities and renovations also are in the planning stages. To date, Mizzou: Our Time to Lead has raised $650 million in the silent phase of the campaign. Tom Hiles, MU vice chancellor for advancement, says the momentum for the campaign has been building steadily for months. Mizzou: Our Time to Lead is directed by the leadership of campaign tri-chairs Cathy Allen, José Gutiérrez and Richard Miller. MU is one of 23 universities around the country currently engaged in $1.3 billion-plus campaigns. This new campaign comes six years after MU wrapped up its first-ever $1 billion campaign, For All We Call Mizzou, in 2009.